Fig. 1 Left: Bradley “The Beast” Field R.I.P., by Steven Parrino. 1997 (MMK). Right: Tanya as a Bandit, by Cady Noland. 1989 (Collection Udo und Anette Brandhorst, Munich). Installation view at Museum MMK Für Moderne Kunst, Frankfurt (Photograph Fabian Frinzel). Fig. 2 Basket of Action, by Cady Noland. 1988. Installation view at Museum MMK Für Moderne Kunst, Frankfurt (Musée des beaux-arts La Chaux-de-Fonds; Photograph Axel Schneider). Fig. 3 Stockade, by Cady Noland. 1987–88. Installation view at Museum MMK Für Moderne Kunst, Frankfurt (Art Gallery of Ontario, Toronto; Photograph Axel Schneider). Fig. 4 Cart Full of Action, by Cady Noland. 1986. Installation view at Museum MMK Für Moderne Kunst, Frankfurt (Art Gallery of Ontario, Toronto; Photograph Axel Schneider). Fig. 5 Saloon Stairs, Blank with Extra Wood, by Cady Noland. 1990. Installation view at Museum MMK Für Moderne Kunst, Frankfurt (Private Collection; Photograph Fabian Frinzel). Fig. 6 Detail of The Mirror Device, by Cady Noland. 1987. 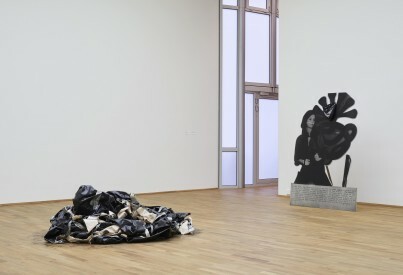 Installation view at Museum MMK Für Moderne Kunst, Frankfurt (Larry Gagosian; Photograph Fabian Frinzel). Fig. 7 Industrial Park, by Cady Noland. 1991. Installation view at Museum MMK Für Moderne Kunst, Frankfurt (Sammlung Eric Decelle; Photograph Fabian Frinzel). When speaking with the cognoscenti of art about Cady Noland’s work it is generally not a matter of determining whether they approve of it or not, but rather where they position themselves on a spectrum of reverence, ranging from the confirmed believer to the evangelical advocate. Having produced an impressive œuvre in a series of intensive bursts of activity, the artist’s near total abstention from making over the last twenty years, alongside her uncompromising stance towards the display and resale of her work, have each contributed to the sacrosanct status she currently appears to occupy for artists, curators and collectors. Having proved herself so visibly resistant to the debasing effects of the art world, Noland has assumed a cult status of sorts. This is a provocative thought to bear in mind when thinking about an artist whose source material figures cults so prominently. This status is something that, unlike the powers that seek to wrest her artworks from her control, she cannot effectively resist. Rejection, it would seem, breeds obsession. One of the contributing factors for Noland’s withdrawal from art-making, and her vigilant policing of the situations in which those works that continue to circulate do appear, is the frequency with which her art was displayed alongside that which she regarded as antithetical to her intentions. 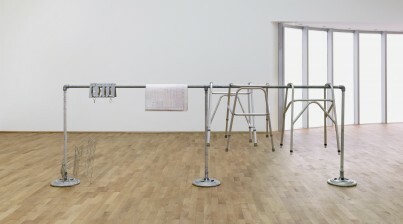 Here, in an inversion of the principles that typically govern the relation of a temporary exhibition to an institution’s permanent collection, an unprecedented survey of her practice occupies the whole of the Museum für Moderne Kunst’s main space in Frankfurt, alongside a handful of judiciously selected works by artists including Michael Asher, Charlotte Posenenske, Sturtevant and Andy Warhol, as well as her father Kenneth Noland. The result is a series of vignettes that resonate with aspects of Noland’s aesthetic sensibility. More space, however, is given over to Noland’s late friend and ally Steven Parrino, who is represented by half a dozen pieces. Parrino’s paintings –bent, crumpled and pierced canvases that contaminate the language of high Modernism with the subcultural logics of punk rock and B-movie horror – form a touchstone through which Noland’s own exploration of American society can be approached FIG. 1. A continuous theme running through Noland’s work is the potential of objects, their implied use and the denial of this purpose. 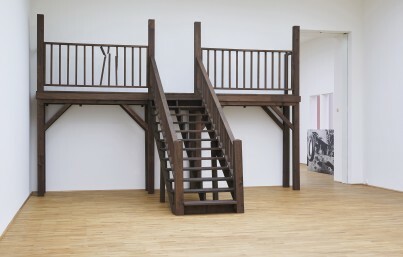 It is present in the clustered arrays of pensioner’s walkers that are suspended immobilised within the scaffolded construction of Frame Device (1989) or in the mechanisms that allow for the actual functioning of Noland’s pillory sculptures (documentation from a show at Paula Cooper Gallery in 1994 features an occupant enclosed in one such work). It appears too in the various stages of obsolescence displayed by the artefacts gathered together in baskets FIG. 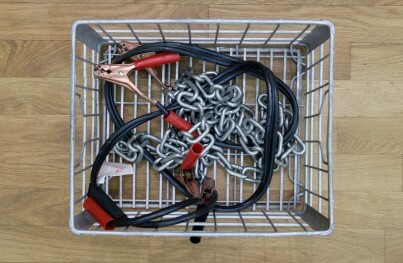 2 and shopping carts or appended to Noland’s signature ‘rail’ assemblages FIG. 3. The material worth of a now vintage Chrysler hubcap resting on top of a pile of similar objects in Cart Full of Action FIG. 4 is forever changing; its compatibility with the contemporary automobile diminishes just as its cultural value as a piece of bygone Americana accrues. It seems appropriate to focus on particular details when describing these works because an attentiveness to detail is intrinsic to the auratic charge they carry. There is nothing casual about the way in which silkscreened sheets of aluminium lean against gallery walls, or in the assortment of camera equipment, cigarette packets, sunglasses, tabloid magazines and rubber matting strewn across a floor in a work such as Celebrity Trash Spill (1989). Noland’s arrangements, much like Parrino’s elegantly distorted canvases, simulate informality more than they enact it. The precise interrelation of their constitutive parts is, to call upon Parrino’s description of Noland’s conceptual process, ‘retentive’ on every level. In the exhibitions that propelled Noland to international notoriety in the late 1980s and early 1990s, many of these same works appeared as bit-players within maximal installations that replicated the sedimentary layers of iconographic detritus steadily filling up America’s psychic landscape. One sculpture that appears in looming isolation here, Saloon Stairs, Blank with Extra Wood FIG. 5, first appeared in an exhibition that took place at Luhring Augustine Hetzler Gallery in Los Angeles the year it was created, crowded in on all sides by a slew of other works.1 It takes on an imposing monumentality apprehended as a stand-alone piece, while also pointing to fundamental shifts in Noland’s thinking around exhibition-making in the intervening period. If these objects once fulfilled a collective role as part of larger ‘trash spills’ reflecting capitalist excess, when set apart they perform as its profane reliquary. Much has been made of Noland’s meditations on the violence of American society, and the way her gestures attempt to unearth the psycho-pathologies it is founded on. Confronted with such a substantial and clinically presented overview of her practice, it is striking how inadequate it is to regard this figure of violence as inhering only in the subject-matter it employs. This violence permeates much deeper than readymade symbols of state authority and male prowess such as the sheriff’s badge, the American football helmet, or the Budweiser can. While it is palpable in the way in which the motifs of healthcare, patriotism, law enforcement FIG. 6 and toxic consumerism vie within her selections of material, these signify more a cartoon violence; a surface effect concealing a deeper, underlying force. If anything, it is the meticulous formality of Noland’s arrangements themselves that are most disconcerting. A painstaking, dispassionate pathology drives her forensic taxonomy of culture, manifesting in a violence that cuts against the ‘action’ that is contained within any of the individual objects on display. 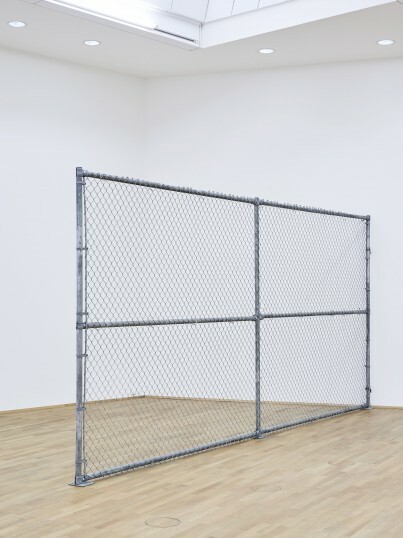 This disciplining force is elsewhere foregrounded in a number of works that take the form of chain-link fences FIG. 7, livestock gates, and other articulations of ‘dead space’. They act as reminders of the obstacles we encounter daily, but expand to implicate art institutions in their critique. By housing such structural intrusions, the galleries at MMK, designed and realised by the Austrian architect Hans Hollein when Noland’s thinking on the totalising nature of institutional violence was nascent, are likewise transformed into sites for its exploration. There is no respite, even in the hallowed halls of culture. The white cube too becomes a disciplinary complex, one that is purpose-built to regulate and control, like some kind of austere amusement park. It forms yet another part of a game that we are all participating in; and as Noland first counselled in 1987, ‘the rules of the game, or even that there is a game at all, are hidden to some’. Neil Clements is an artist based in Glasgow. 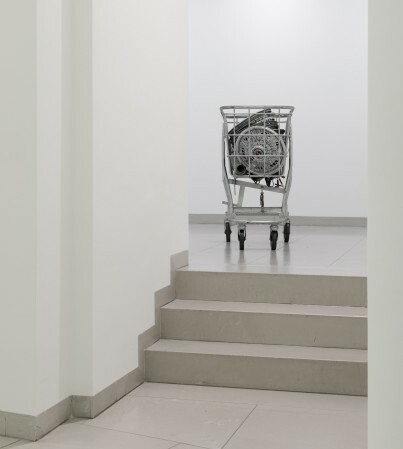 For installation views of the 1990 exhibition, see the Galerie Max Hetzler website: https://www.maxhetzler.com/exhibitions/cady-noland-1990#img9, accessed 22nd March 2019.